It has been requested that people perform a song in the style of the show/character to audition… Please bring the sheet music with you. Audition pieces will be only be available at the actual audition and not beforehand… So please don’t request them. To register your interest please email admin@altrinchamgarrick.co.uk and put ?Annie? ?as the subject. All parts currently open to Garrick members and non members.If successful you will have to join the society, pay your subs and become a member. The creative team encourage actors of all ethnicities to audition for this musical production of ANNIE. We are also open to unique and new interpretations of these famous roles so please, if you feel like you are not the obvious casting for a character…come along anyway! 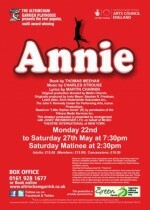 We want this production of ANNIE to be edgy, punchy and energetic whilst holding on to its traditional Broadway style. Annie is a complex, tough, streetwise urchin who is nevertheless vulnerable. She has to be motherly, independent, overwhelmed, needy, and hopeful for the future. The actor who plays Annie must be strong vocally and musically. Although she is at times aggressive or crafty, the audience should never doubt Annie is a friendly and caring child. Age: 10 to 12. He must appear middle-aged, self-assured and confident. At first awkwardly affectionate toward Annie, he soon finds himself completely charmed by her. Capable of showing emotional transformation and maturity. Age: 35 to 55. Grace is mature, calm, cool and “together.” She is classy and businesslike when dealing with Miss Hannigan and Warbucks, yet maternal toward Annie. Age: 20 to 35. This woman is definitely a “has-been.” Her distaste for her job and the children that are part of it should be obvious in every line she speaks, every song she sings and every move she makes. The actor who plays her must have an excellent sense of comic timing.. Age: 30 to 45. Distracted airhead, a bit bumbling, girlfriend to Rooster. Age: 20 to 30. Flashy, self-assured, brother to Miss Hannigan. Con-man always looking for a quick buck. Age: 25 to 35. These girls are gritty, neglected and vulnerable, yet basically honest and potentially lovable. The actors portraying them must be able to have mischievous fun with each other as well as ?sibling- style? fights. Attentive domestic help. Head is always held high; rarely show emotions. The ultimate radio personality. Helps Annie by broadcasting about the search for her birth parents. Age: 25 to 45. The 32nd President of the United States. A Democrat and friend of Warbucks. Age: 40 to 60. Ensemble and other Cameo Roles to be cast also.